Meditate in real time and see the world around you. - fixed a bug with refill interval being two hours instead of one. - added an option to turn off text messages of the mod. - health and refill options were removed from the mod (see Preparations mod). - fixed a problem with not being able to assign overlapping real time meditation and meditation menu hotkeys (make sure you switch "Unlock bindings" on first if you want to do this). - fixed a bug where potions refill time setting was having no effect. 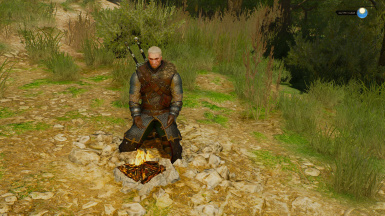 The mod introduces real time meditation into the game: start meditation as usual or press a hotkey for Geralt to assume meditation pose and time begin to fast-forward. No menu cluttering the view, meditation is as immersive as it can possibly be. While vanilla meditation simply clears all buffs and advances time, real time meditation actually updates all buffs, toxicity, etc in accelerated time as you meditate. This means that all potions and skills like Sun and Stars continue to function properly during meditation, restoring your health. Same as vanilla, real time meditation also refills all your alchemy after you've meditated for an hour. 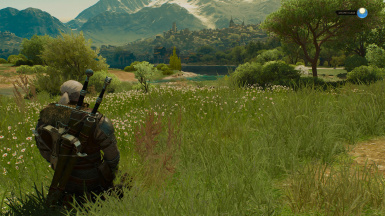 Real time meditation uses special fully configurable camera with three presets available in the options menu: camera facing Geralt, "sightseeing" camera and default exploration camera with larger FOV (field of view). You can switch special camera off if you don't like it. 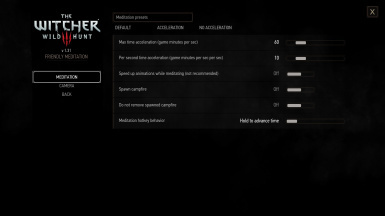 There are several modes for meditation hotkey: in hold mode Geralt meditates for as long as you hold the button; in switch mode you hold the button to start meditation and then hold the button again when you decide to end it; in manual mode meditation hotkey is used to assume meditation pose and another hotkey is used to advance time - you can use this one for enjoying the scenery with "sightseeing" camera preset. 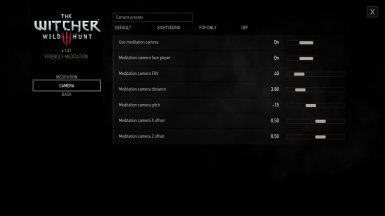 It's recommended to use The Witcher 3 Mod Manager (TW3MM) available on Nexus for installing/uninstalling the mod. TW3MM installs all parts of the mod automatically, no additional manual steps are needed. For manual install/uninstall instructions read the readme. If you're using the mod alongside with Preparations mod, make sure to use "Preparations" preset in mod's options. - Mazii for the Czech localization. - Belzebox for the French localization. - Xyarvius for the German localization. - BowmoreLover for the Japanese localization. - PumpernikeL for the Polish localization.